by Chris Woodford. Last updated: June 7, 2018. You started your morning with ceramics—and they'll dominate your day. Inside your brick, cement, and glass home, you woke to the quartz clock, washed in the tiled bathroom, breakfasted on pottery cups and bowls. Maybe you worked all day at a computer (packed with ceramic-based electronic components, like microchips, capacitors, or resistors), before heading back home for a glass of wine, gobbled down dinner from those same pottery plates, and sat in front of the liquid-crystal TV (or Gorilla glass smartphone), before heading for bed and setting the quartz clock, ready to repeat again tomorrow. Though it's far from obvious, we live in a ceramic world, just as people have for thousands of years. But what exactly are ceramics? 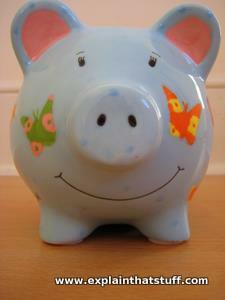 Photo: A ceramic Percy Pig piggy bank. It started life as a soft piece of clay molded to shape, fired hard in a pottery kiln, then painted with bright colors. 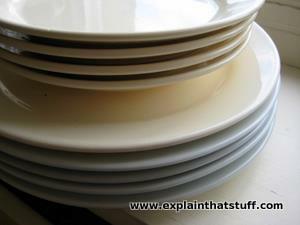 Photo: Porcelain plates are very familiar examples of ceramics, but there are other, much more surprising uses of ceramics too. Glass, tiles, pottery, porcelain, bricks, cement, diamond, and graphite—you can probably see from this little list that "ceramics" is a very broad term, and one we're going to have difficulty defining. What do all these very different materials have in common? From a chemical viewpoint, we define ceramics in terms of what they're not. So you'll find most science textbooks and dictionaries telling you ceramics are nonmetallic and inorganic solids (ones that aren't metal or based on carbon compounds); in other words, ceramics are what we're left with when we take away metals and organic materials (including wood, plastics, rubber, and anything that was once alive). Some books also try to define ceramics as "refractory" materials, which is a technical, materials science term that means capable of putting up with everyday abuses like extremes of temperature, attacks from acids and alkalis, and general wear-and-tear. It often seems easier to define materials in terms of their properties (how they behave when we heat them, pass electricity through them, or soak them in water, for example). But once we start doing that, things can get confusing. For example, graphite (a form, or allotrope, of carbon) is considered a ceramic because it's nonmetallic and inorganic, yet (unlike most ceramics) it's soft, wears easily, and is a good conductor of electricity. So if you looked only at the properties of graphite, you wouldn't consider it a ceramic at all. Diamond (another form of carbon) is also a ceramic for the same reason; its properties couldn't be more different from those of graphite, but they're similar to those of other ceramics. (Like modern ceramics such as tungsten carbide, diamond has long been used in cutting and drilling tools). People first started making ceramics thousands of years ago (pottery, glass, and brick are among the oldest human-invented materials), and we're still designing brand new ceramic materials today—things like catalytic converters for today's cars and high-temperature superconductors for tomorrow's computers. There's quite a big difference between age-old, general-purpose ceramics like brick and glass and modern, engineered ceramics that are sometimes designed for a single, specific purpose, such as filtering soot from a truck's dirty diesel engine or making a drill bit that lasts five times longer. That's partly why materials scientists like to divide ceramics into two kinds: traditional, and advanced (or engineering) ceramics. 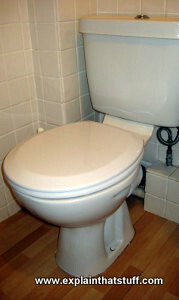 Photo: Traditional ceramics: Toilets are a good example, though the lid and seat are typically made of plastic or wood. Bricks, pottery, glass, porcelain, tiles, cement, and concrete are our classic, time-tested ceramics. Although they all have different uses, we can still think of them as general-purpose materials. Take tiles, for example. We can put them inside our homes or outside; on the walls, the floors, or the roof; and we can stick glass in our windows or poke away at it on our smartphone screens—we can even drink champagne out of it. Ceramics like this are ancient materials—ones our ancestors would recognize—that have gradually found more and more uses as the centuries have worn on. By contrast, advanced ceramics are ones that have been engineered (mostly since the early 20th century) for highly specific applications. For example, silicon nitrides and tungsten carbides are designed for making exceptionally hard, high-performance cutting tools—though they do have other uses as well. Most modern engineered ceramics are metal oxides, carbides, and nitrides, which means they're compounds made by combining atoms of a metal with oxygen, carbon, or nitrogen atoms. 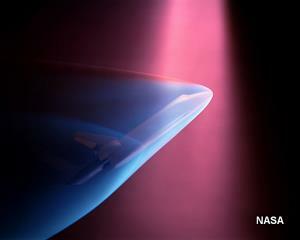 So, for example, we have tungsten carbide, silicon carbide, and boron nitride, which are hard, cutting-tool ceramics; aluminum oxide (alumina) and silicon dioxide are used in making integrated circuits ("microchips"); and lithium-silicon oxide is used to make the heat-protective nose cones on space rockets. High-temperature superconductors are made from crystals of yttrium, barium, copper, and oxygen. Not all high-tech ceramic materials are simple compounds. Some are composite materials, in which the ceramic forms a kind of background material called the matrix, which is reinforced with fibers of another material (often carbon fibers, or sometimes fibers of a totally different ceramic). A material like this is known as a ceramic matrix composite (CMC). Examples include silicon carbide fibers in a silicon carbide matrix (SiC/SiC) with boron nitride at the interface between them—a material used in cutting-edge gas-turbine jet engines. Photo: Advanced ceramics: Silicon and carbon fuse to form silicon carbide powder (left), which can be made into a hard and hard-wearing ceramic called silicon carbide that can survive high temperatures. It has many applications, from drills and cutting tools to components (middle, right) that can withstand high temperatures in gas-turbine engines that would melt ordinary metal parts. Ceramic components are also used in ordinary car engines for the same reason. Picture by Warren Gretz courtesy of US Department of Energy/National Renewable Energy Laboratory (NREL) (picture id 6307388). What properties do ceramics have? As we've already seen, the most important general property of ceramics is that they're refractory: they're rough-and-tumble materials that will put up with fair amounts of abuse in the most ordinary and extraordinary situations. Just consider, most of us tile our kitchens and bathrooms because ceramic tiles are hard, waterproof, largely resistant to scratches, and keep on looking good for year upon year; but engineers also put (very different!) ceramic tiles on space rockets to protect them against heat when they whiz back to Earth. High melting points (so they're heat resistant). Considerable durability (they're long-lasting and hard-wearing). Low electrical and thermal conductivity (they're good insulators). Chemical inertness (they're unreactive with other chemicals). 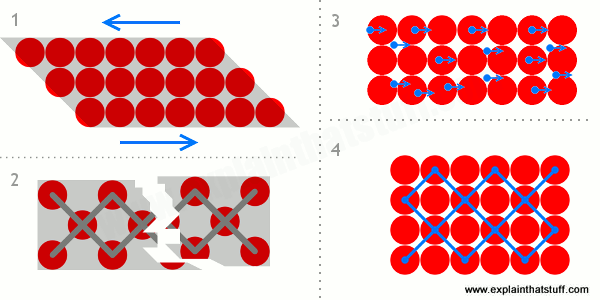 Most ceramics are also nonmagnetic materials, although ferrites (iron-based ceramics) happen to make great magnets (because of their iron content). Those are the useful points, but, thinking about traditional ceramics like glass or porcelain, you'll also have noticed one major drawback: they can be fragile and brittle, and they'll smash or shatter if you drop them (subject them to "mechanical shock") or suddenly change their temperature ("thermal shock"). Why are ceramics like this? In metals, for example, atoms are relatively weakly bonded (which is why most metals are fairly soft); their electrons are shared between them in a kind of sea that can "wash" right through them, which is (simplistically speaking) why they conduct electricity and heat. A material like rubber, on the other hand, is made of long-chain molecules (polymers) that are very weakly attached to one another; that's why raw, white, latex rubber is so stretchy and why black, vulcanized rubber (like that used in car tires) is harder and stronger, because heat-and-sulfur treatment makes strong cross-links form between the polymer chains, holding them tightly together. All the electrons are locked up in bonds of various kinds (none are free to carry an electric current), and that's why rubber is generally a good insulator. Ceramics are different again. Their atoms are ionically bonded (like sodium and chlorine in sodium chloride, common salt), which holds them firmly in place (making ceramics hard and strong) and locks up all their electrons (so, unlike in metals, there are no free electrons to carry heat or electricity). Metals can bend, stretch, and be drawn into wires because their rows of regularly packed atoms will slide past one another. But in a ceramic, there are no rows of atoms; the atoms are either locked in a regularly repeating three-dimensional crystal or randomly arranged to make what's called an amorphous solid (a solid without a neat and tidy, internal crystalline structure). If you whack a lump of metal with a hammer, the mechanical energy you supply is dissipated as layers of atoms jump past one another; in other words, the metal bends out of shape. If you whack a ceramic such as glass, there's nowhere for that energy to go—no way for the glass to deform and soak up the blow—so it shatters instead. This explains why ceramics are both hard and brittle. As we've already seen, not all ceramics behave this way. Graphite is soft because it's made of layers of carbon atoms that will slide and shear (that's why a graphite pencil leaves lines on paper); diamond is hard because it has a much more rigid crystalline structure. Clay dug from the ground is soft and pliable because, like graphite, its atoms are made of flat sheets that can slip past one another, held together only by weak bonds. When you add water to clay, the polar water molecules (positively charged at one end, negative at the other end) help to pull those bonds apart, making the clay even more malleable. When you fire clay, the water evaporates and the aluminum, silicon, and oxygen atoms lock into a rigid structure made from aluminum silicate, bonded together by silicate glass—and that's why fired clay is so hard. Artwork: Why do ceramics and metals behave differently? 1) You can bend metals because the atoms inside them can slide past one another fairly easily. 2) In a ceramic, the atoms are tightly bonded. If you apply too much force, the only thing a ceramic can do is break apart: the energy has nowhere else to go. 3) In metals, there are free electrons (blue) to carry heat and electricity. That's why metals are good conductors. 4) In a ceramic, the electrons are all "busy" binding atoms together and there are none spare for carrying electricity and heat. That's why ceramics tend to be good insulators (non-conductors). What are ceramics used for? From glass and brick to porcelain and cement, we've already seen that there are countless different things that can be described as ceramics; not surprisingly, then, there are literally hundreds of different applications for ceramic materials in everything from aerospace to zoo-keeping. Photo: Ceramic tiles helped to protect the Space Shuttle from heat when it came back into Earth's atmosphere. Picture courtesy of NASA on the Commons. If aerospace is an extraordinary use for extraordinary ceramics, construction is one of the best known uses for ordinary, everyday ceramics. Even in our modern age of plentiful plastics, brick, glass, cement, concrete, porcelain, and tiles of all kinds are still the raw materials from which most buildings are made. The tools used on construction sites are often made with ceramics too. Whether you're cutting glass, drilling holes in tile, grinding concrete, or sawing through brick, engineering ceramics like tungsten or silicon carbide will help you knock more traditional ceramics into shape, generally working better, for longer, than traditional tools made of steel. Ceramics aren't always at the cutting edge; a lot of the time, we don't notice them at all—especially when they're hiding inside electrical and electronic equipment. Anything with an electric motor (that's every chore-busting, electric-powered machine in your home) contains magnets, and quite often they're made from ferrite ceramics. (You'll also find ferrite magnets, or other kinds of ceramic transducers, in loudspeakers and headphones.) While we use conducting metals like copper to carry electricity from place to place, we have to use ceramics to insulate high-voltage electricity in places like power plant generators and transformers. Sometimes, ceramics insulate us from electricity and heat at the same time: heating elements are often built into ceramic holders, electric cooktops are made from high-performance ceramic glass, and incandescent lamps have glass bulbs that protect us from heat and electricity while protecting their filaments from the atmosphere. The most advanced electrical use of ceramics is probably in high-temperature superconductors (materials with virtually no electrical resistance). While traditional superconductors have to be cooled down to near absolute zero (−459.67°F or −273.15°C), these new ceramics become superconducting in relatively warm conditions (still a chilly −292°F or −180°C! 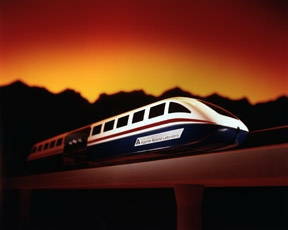 ), which makes them far more practical for use in things like floating "maglev" trains and cutting-edge computers. Photo: High-temperature superconductors made from ceramics could allow electricity to flow through things with little or no resistance, making possible technologies like superfast computers and "floating" Maglev trains. Picture courtesy of US Department of Energy. "Animal, vegetable, or mineral? "—so goes the famous guessing game; and there's a temptation to see mineral-based ceramics as artificial, unnatural, and quite apart from the living, breathing world we all inhabit. It's perhaps surprising, then, to find so many applications for ceramics in the world of medicine. How about the piezoelectric transducers that create ultrasonic waves used in pregnancy scans? Or what about dentures (false teeth) made from porcelain or glass eyes? Or bone implants made from silicon nitride, which are cleverly designed to be porous so they promote natural bone growth? If you're wondering what ceramics have to do with zoology (as I suggested up above), you'll find plenty of dogs that—just like us humans—have had ceramic implants in their bones and teeth. How do you make ceramics? Ceramics generally start with a clay-based material dug from the ground that's mixed with water (to make it soft and flexible) and other materials, squashed into shape, then fired at high-temperature in a large industrial oven called a kiln. Firing is what most ceramics have in common; the very word "ceramic" originally comes from Sanskrit and means "to burn." These four basic processes—digging the raw material from the ground, adding water, shaping, and firing—have been used to make ceramics for thousands of years. Photo: Ceramic floor tiles get their hardness and durability from being fired. Picture by Michael Sandberg courtesy of US Navy. Common clay is mostly used for bricks, cement, and aggregate. Kaolin is widely used for making glossy paper. Bentonite has a variety of industrial uses, including drilling mud and foundry sand, and is also found in household products that absorb pet waste. Ball clay is a high quality clay prized for its use in ceramics, sanitaryware, and wall and floor tiles. Fuller's Earth is also used for pet-waste products. Fire clay is used in refractory (high-temperature) bricks and cement. Each one of these also has numerous different grades and qualities, so it's probably more accurate to talk about China clays or Ball clays in the plural. Ball clay, for example, is used to make things like fine porcelain tableware and bathroom suites, but even within a single ball clay mine, different grades of clay will be simultaneously excavated from different areas and kept separate (or blended in various ways) for different end uses. Before they're fired, raw ceramics can be shaped in all kinds of ways; different manufacturing processes are used for different end products. So pipes, for example, are made by extrusion (squeezing clay through a hole, a bit like toothpaste from a tube). Glass is made by blowing, molding, or being floated on top of water (the float-glass process by which large, flat windows are made). Bricks, on the other hand, are almost always made in molds to ensure they're a consistent size and shape for stacking into walls. While a great deal of modern pottery is molded, some is still thrown by hand, on a foot-powered wheel, in the traditional way. Other ceramic processes include pressing (squeezing powder into a mold), casting, and jiggering (laying raw material into a rotating mold). Advanced engineering ceramics are often made in more advanced ways. For example, the silicon nitride used in cutting tools is made by reaction bonding, in which silicon powder is squashed into shape and heated with nitrogen gas. What's the easiest way to build a house or a wall? With bricks, of course! They're simple to use, inexpensive, attractive to look at, and they can last hundreds of years. Some of the most famous constructions in history have been made from brick, including parts of the Great Wall of China and many of the structures built during the Roman Empire. 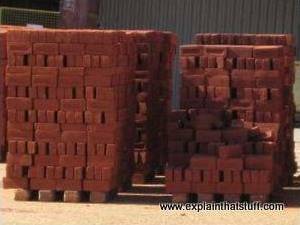 Photo: Most bricks are this distinctive red-brown color because of the iron they contain. 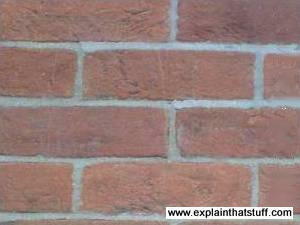 This brick pattern is an example of what's called runner bond: all the bricks are pointing the same way but the bricks in one course run over the joins in the course beneath. Stone is a natural building material you can use the moment you dig it out of the ground. Bricks, on the other hand, have to be made from clay before we can build with them. As we've already seen above, clay is a naturally occurring ceramic based on the chemical elements aluminum, silicon, and oxygen. If you've ever dug wet, clay-rich soil, you know it's very thick and sticky. To turn this gooey material into hard, durable bricks, we have to cut and mold it into rectangular chunks which are then fired in an industrial oven called a kiln at temperatures of over 1000°C (1800°F). Bricks are popular as building materials for several reasons. First, clay is available throughout the world in large quantities and brickmaking is a fairly simple process, so bricks themselves are relatively inexpensive. Building bricks are much lighter and easier to work with than stone and sometimes last longer. They're attractive to look at, weatherproof, and—like other ceramics—very good at resisting high temperatures. By using different clays, it's possible to make bricks in different colors. Traditional red bricks take their color from iron in their clay, while yellow bricks have a greater quantity of lime or chalk. Building bricks are made to a standard size (typically 20–22cm long, 9–11cm wide, and 5–7cm high (approx 8–8.5in long, 3.5–4.5in wide, and 2–3in high), with the dimensions varying slightly from country to country). They're made from higher grades of clay and finished on at least one side (face) so they look attractive on houses and walls. Refractory bricks are made for high-temperature use for lining such things as industrial smokestacks (chimneys) and household fireplaces, so they tend to be made more crudely and less attractively finished. Unlike ordinary bricks, they're typically made using such raw minerals as fireclay, alumina (aluminum oxide), silica (silicon oxide), and dolomite (calcium magnesium carbonate). Some are designed to survive temperatures over 2000°C (3600°F); the "ceramic tiles" that protected the Space Shuttle from heat when it re-entered Earth's atmosphere from space were actually very thin refractory bricks. Photos: Left/above: Millions of bricks are made every day, but why are they this color? 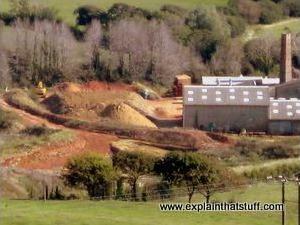 Right/below: Take a look at the brickworks where those bricks were made (near Swanage, Dorset, England) and you can see the clay in the ground is pretty much the same reddish-brown color due to the iron it contains. Brickworks (brickmaking plants) are built in places where there are large supplies of clay available nearby. The first stage in making bricks involves digging the clay from pits in the ground. Raw clay isn't immediately usable as it is: rocks and other impurities have to be removed first by screening and filtering. The clay is then mixed with water and kneaded in machines that resemble giant food mixers or modern breadmaking machines. The now-soft clay mixture is squeezed out through a rectangular-shaped hole (imagine toothpaste squeezing from a tube with a square-shaped hole) in a process called extrusion. Building bricks often have holes bored into them, partly to make them lighter and less expensive but also so the mortar penetrates inside them and holds them more securely. Wires cut the lengths of clay into separate bricks, which are then stacked up on trucks and moved into drying rooms where the moisture they contain is allowed to evaporate over a period of about a day or so. Once that process is complete, the trucks are moved again into giant kilns (the ovens that turn the soft clay into hardened bricks ready for building), some of which are over 100m (330ft) long! The firing time and temperature vary according to the type of clay being used and the type of end-product required. Although much more efficient, this process—digging the clay, shaping it, and heating it to harden it—is essentially the way bricks have been made for at least 6000 years. Traditionally, bricks were shaped by hand and left to fire in the sun. Sun-dried adobe bricks are still made this way. Refractory bricks (also called fire bricks and fireclay bricks) are made by a slightly different process. Since they need to withstand much higher temperatures than ordinary building bricks, the clay they're made from is compressed by hydraulic rams to make a much more dense mass, before the bricks are shaped and loaded into the kiln. That's why refractory bricks and much heavier than ordinary building bricks of roughly the same size. Brick: A World History by James W. P. Campbell and Will Pryce. Thames & Hudson, 2003/2016. A fascinating, comprehensive history of how humans have used brick from neolithic times to the present day. Lavishly illustrated. Brick in the Landscape: A Practical Guide to Specification and Design by Rob W. Sovinski. John Wiley and Sons, 1999. An unusual book that explores the use of brick, as a traditional material, for hard landscaping in gardens and other outdoor areas. Bricks and Brickmaking by Martin Hammond. Shire, 2009. A short (32-page) booklet explaining why bricks have been so popular for so long. Focuses mainly on British architecture. 23,000–25,000 BCE: Earliest use of human ceramics (for example, in figurines of humans and other animals made of pottery, discovered at Dolní Věstonice in the Czech Republic). 14,000BCE: Ceramic tiles are being made in India and Mesopotamia. 18,000–14,000 BCE: Earliest use of pottery vessels (for example, in Jiangxi, China). 7500–6500BCE: First use of mud bricks. 3500–5000BCE: Earliest use of glass (according to Eric Le Bourhis in Glass: Mechanics and Technology). 3500–2500BCE: Invention of the potter's wheel. Mid-late 1900s: Development of effective glass and ceramic insulators for telegraphs and electric power distribution. 1940s: Development of ferrite magnets for such things as loudspeakers and electric motors. 1986: High-temperature superconductors discovered by Georg Bednorz and K. Alex Müller of IBM. The American Ceramic Society: The Resources section has some useful educational materials. British Ceramic Confederation: Some useful information about the ceramics industry and the huge range of everyday products it supports. One Designer's Crusade to Save Oaxacan Pottery From Extinction by Margaret Rhodes. Wired, April 29, 2016. How Kythzia Barrera is battling to save ancient ceramic crafts by creating a new international market for them. Remnants of an Ancient Kitchen Are Found in China by Sindya N. Bhanoo. The New York Times. June 28, 2012. How the world's oldest-known pottery fragments were discovered. The Ceramics Reader by Kevin Petrie and Andrew Livingstone (eds). Bloomsbury, 2017. A wide-ranging series of essays that explores the history and cultural significance of ceramics. Ceramic Materials: Science and Engineering by C. Barry Carter and M. Grant Norton. Springer, 2013. A broad-based textbook for students of material science. The Magic of Ceramics by David W. Richerson and Bonnie J. Dunbar. American Ceramic Society, 2012. An engaging introduction that demonstrates the importance of ceramics in our modern world. Fundamentals of Ceramics by M. W. Barsoum. Institute of Physics, 2003. A classic introduction to the science of ceramics.